The half-mile reach of Seiad Creek targeted by this project contained poor coho salmon habitat thanks to impacts from placer mining and gravel push-up levees. Large Woody Material (LWM) was a fundamental element of the instream habitat structures GeoEngineers designed. GeoEngineers' river restoration designs included main channel and secondary channel geometry modifications, levee removal, instream habitat structures and a revegetation plan. The LWM restoration included approximately 980 individual trees with root wads, placed at 53 different locations in 12 different types of large-wood structures. 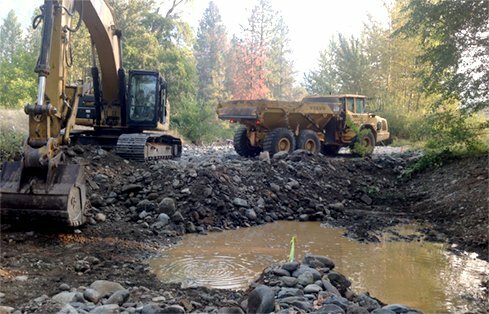 Transforming a heavily-impacted reach of Seiad Creek into a functioning riverine ecosystem. 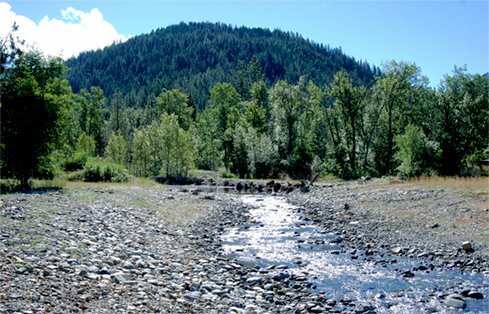 Seiad Creek is one of the most productive coho salmon tributaries in the Klamath River system. 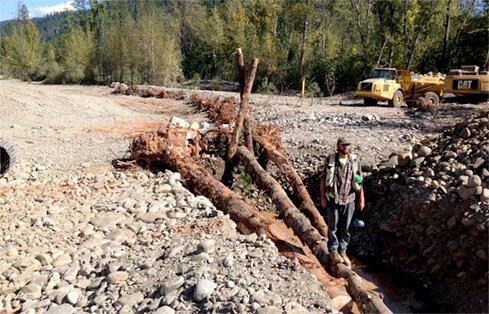 Located in the Northern California town of Seiad, most of the creek system contains high-quality fish habitat, but the habitat through the half-mile reach targeted by this project was a glaring exception. 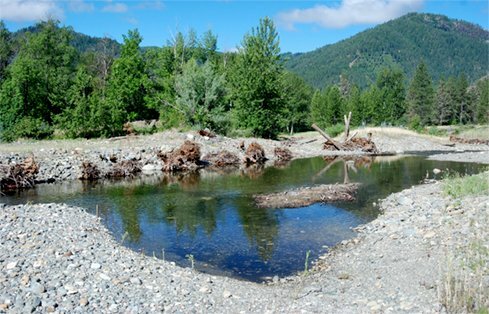 More than a century of placer mining and gravel push-up levees had impacted the historic floodplain along both banks of the channel, negatively affecting salmon spawning. The Karuk Tribe of California contracted with GeoEngineers to restore natural function to this section of Seiad Creek and improve salmon habitat. GeoEngineers completed geomorphic and habitat assessments, conceptual designs, preliminary designs, final construction drawings and construction observation for the project. The river restoration designs included main channel and secondary channel geometry modifications, levee removal, instream habitat structures and a revegetation plan. Large Woody Material (LWM) was a fundamental element of the instream habitat structures GeoEngineers designed. The structures focused on restoring floodplain connectivity and natural riverine processes, while also providing immediate salmonid habitat diversity. The LWM restoration included approximately 980 individual trees with root wads, placed at 53 different locations in 12 different types of large-wood structures, ranging from individual to multi-log accumulations of various sizes. GeoEngineers’ river designs transformed a heavily-impacted reach of Seiad Creek into a functioning riverine ecosystem. By modifying channel geometry, removing old levees and adding in-stream LWM habitat structures the team created new habitat to support the critical coho salmon population that relies on Seiad Creek for spawning and fish rearing.